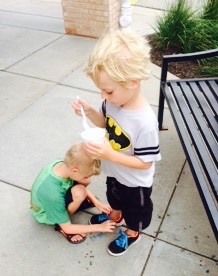 Will you please tie my boys’ shoes? I’m sorry. I hoped to take a chunk of time this summer to practice with them. I eventually resolved to double and triple, sometimes quadruple knot their shoelaces. Their constantly running, jumping, and kicking bodies manage to loosen up all the knots. Always. All days. We just got so busy. And even though summer started out with all of the June rain, July raced by too quickly. It always does. Long sun-filled summer days won’t be had again until my boys are older, bigger and smarter. Mostly because of your patience, your expertise, and your passion for teaching them. A lot of the time, I have a hard time managing my three children. I don’t quite know how you can captivate an entire classroom of six to seven year olds for an entire day. All week long. You must have an endless supply closet filled with patience. And you’ve got to be exhausted at the end of the day. I heard you say that you have three children of your own. You help kids learn all day long. And then you go home and help your own. I wholeheartedly believe that you have one of the most important jobs. You truly help shape the lives of the most precious boys and girls that fill your brightly decorated, first grade classroom. Even if they all may not act so precious at times. I am certain you must have moments when you need to escape to a secret hiding place to take deep breaths. I am sure you have moments where you need a coffee or a coke or maybe some chocolate. Maybe a margarita. You don’t have that luxury because you constantly have all of these big, beautiful eyes staring at you, watching your every move, especially when you wish they weren’t. You possess the power to forever imprint the hearts of my children. All of our children. You have the privilege of spending more waking hours with my boys than me Monday through Friday. That hurts a little. Actually, a lot. It makes me worried. And nervous. And also hopeful. And beyond grateful for you, even though I just met you. I know you will do your best to teach them all of the confusing sounds that letters make together. Just today we were talking about “pharmacy.” Tricky old pharmacy. Why does the “ph” make the sound of an “f?” my boys asked me. You will be able to answer these questions much better than I can. That’s hard for me to say. It’s hard when somebody else, specifically another woman, can do something better for my kids than I can. It’s humbling. It makes me want to show you how great of a monster I can be on the playground or show you how much my boys love to snuggle right up next to me, even on top of me, when we’re watching a movie. I don’t think I need to show you these things for you to know how much I love them. I’m confident that you will teach my boys math tricks and reading skills. You probably have the coolest, most fun and exciting ways to do it. But I can’t stop thinking about something else that matters more: I’m trusting you to guide them gently and show them love. I don’t ask for help often. I can be puffed up and proud like that. But I want you to know that I’m depending on you to recognize when somebody hurts my boys’ feelings or when they hurt some little boy or girl’s feelings. Will you please teach kindness and forgiveness and compassion too? And hopefully, you will notice when they’re having a bad day. It pains me to think that I can’t be there in these moments to help make things better. I know they will be proud to show you all of their work. They may even like you so much that they call you, “Mom.” That’s the greatest compliment you could ever receive, in my opinion. They are two of the most beautiful, unique, inquisitive, loving, kind-hearted and energetic boys I’ve ever met. I know I’m a little biased, but I have worked with a lot of kids. I hope you will look at them and appreciate their passion, their joy for life, their imperfections and also their fragility. I hope you will remember that they’re still learning a lot about life. From August until May, you will have an enormous impact on their little hearts and minds. Thank you for teaching my boys. And thank you for taking the time to kindly bend down and tie their shoelaces. I recommend the triple knot. I recall the pangs of sending my first 3 to school all-day, knowing they would be at school more waking hours than with me. It is a hard pill to swallow, and two at once would be twice as hard….but they will grow and learn so much and have so much fun! And you better have those listening ears ready after school because they are gonna have a lot to tell you about their big day….every day! They can’t quite grasp the concept of all day. “Will we eat dinner there?” “Will it be dark when we get home?” Long days. Probably longer for the mamas, right?